Just how are you supposed to make your plane when you have to haul a baby, car seat, stroller, diaper bag, carry-on bag and more through the airport? Air travel with a baby isn't always easy, and some of the struggles start before you ever board the plane. 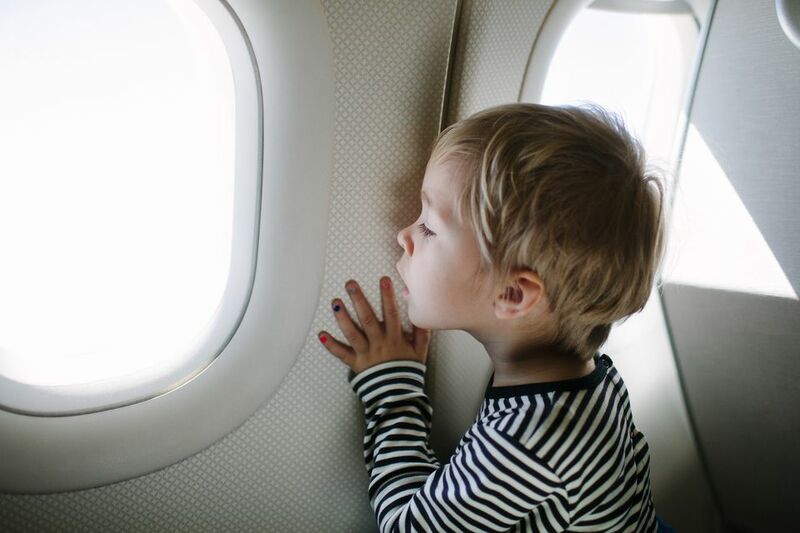 These simple tips will help you manage your baby gear before and after you board the airplane and make the entire air travel experience more pleasant for you and your baby. Many parents debate over whether or not to bring their baby's car seat on an airplane trip. If you plan to travel by car once at your destination, you'll need baby's car seat anyway. Car seats are sometimes available for rent, but you never know what the quality will be on a rental seat, and the car seat may have been in an accident, making it a risky choice for your baby. Take the car seat with you. Better safe than sorry. Should I Buy Baby A Seat? Most airlines let children under age 2 ride in an adult's lap. You can check your child's car seat with your other luggage, but wrap the seat in plastic or a bag for protection. I suggest buying the baby a ticket and using a car seat on the airplane, no matter the age. Babies who aren't in car seats can be injured when a parent can't hold on during severe turbulence. If your flight isn't full, you may be able to take the car seat and use it without buying a ticket, if seats are available. If you're certain you won't need a car seat after you deplane, there's a cool product called CARES that helps keep baby safely restrained in the airplane seat. The CARES airline harness (Buy on Amazon) works for toddlers up to 40 pounds, and wraps around the seat (under the tray table), providing shoulder straps to keep wiggly little ones in their seat. One carry-on bag that serves the role of a purse, briefcase and diaper bag is the most pared down choice for air travel. My favorite carry-on bag is a large Baby Sherpa backpack (Buy on Amazon) that I can share with baby. A backpack is easy to carry when your arms are otherwise occupied, and easily holds diapers, snacks, airline tickets, identification and even a spare outfit for baby. Most importantly, a backpack holds plenty of baby gear and still meets most airline requirements for carry-on baggage size. Even the smallest babies feel heavy after a long time in your arms, and toddlers often decide they can't walk any longer at the most inconvenient times. A stroller solves these problems. Most infant car seats snap onto a travel system stroller, making it simple to take both along for the trip. Otherwise, a lightweight stroller with a carrying strap is easy to haul around and might help you make a connecting flight if your toddler's legs give out. Once you make it to your gate, ask the gate agent for a gate check ticket for your baby's stroller. Gate checking means you'll leave the stroller at the gate or jetway before you board the airplane, and it will be waiting for you as you exit the plane after the flight. This is very convenient if you need the stroller for a connecting flight. Most airlines also allow parents traveling with babies and toddlers to board the plane early, giving you ample time to install a car seat and get settled. If you purchased a ticket for your baby, you'll need to install the car seat on the plane. Airline seatbelts can be hard to tighten when buckled with a car seat, so you may have to ask a flight attendant for help. Check the manual to be sure that your baby's car seat is FAA approved for air travel before taking it on the plane. Also, note that baby car seats can only be installed in a window seat on most airlines. A baby sling or backpack carrier may help you carry baby quickly through an airport, too. Some parents have successfully used a baby sling or special flight vest during the airplane trip to keep a baby close when the baby doesn't have a ticketed seat. However, some airlines do not allow slings or flight vests to be used, particularly during takeoff and landing, so be aware that you may be asked to put these items away while on the plane. If you're preparing for a long trip, or you travel a lot, invest in some top of the line baby travel gear to lessen travel hassles. A wheeled car seat carrier lets you wheel baby right to the plane and board. The GoGoKidz Travelmate (Buy on Amazon) is a nice option for kids in convertible car seats. Smaller infants can ride in the Doona infant car seat, which has wheels that fold out to form a stroller. Add a set of travel straps to baby's regular car seat and wear it like a backpack. Look for disposable feeding supplies like bibs, bottles, sippy cups and utensils so that you don't have to clean up during your trip. And don't forget to buy a few new toys to keep baby entertained! Getting ready for an international flight? Here are my survival tips. You have travel questions? We have answers. Save cash for souvenirs. Buy travel necessities at a dollar store.